Written by Keith Monroe, Prince George, BC. Over the years, I have been involved with and volunteered on many occasions with BC Parks. This has mostly been driven by my love of BC’s beautiful wilderness. My interests have particularly been with Northern BC. 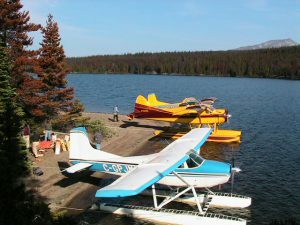 I have been a member of the BC Floatplane Association since it’s inception in 1998 and through that organization have been involved in several park enhancement projects (assisting in cleanup of old campsites, setting up outhouses, tent frames etc.). We also continually report observations to BC Parks staff (cabin conditions, park activity, ice out information, wildlife sightings etc.). Below are a couple of photos of a BCFA cleanup operation at Fenton Lake in Tweedsmuir Park. 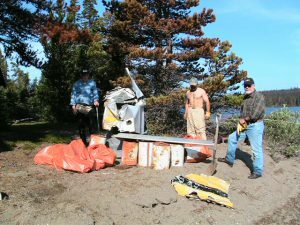 Three plane loads of garbage were hauled out! One of my favourite parks is Kakwa. Our family has a significant history with Kakwa Park. 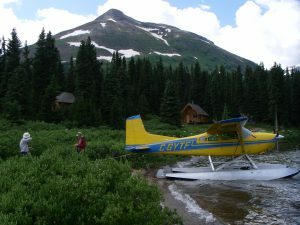 My father Everett guided there back in the 1950’s and he discovered the significant quartzite deposits near Babette lake. 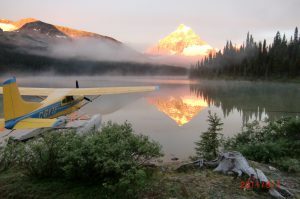 A mountain near Kakwa lake was named after my brother Ian after he died in a helicopter accident. My brother Bryan and his hunting partner discovered Dinosaur tracks near the north end of Kakwa Park a few years ago and have become known as the “Monroe tracks”. My brother Norm and his wife Barb have been park hosts in Kakwa on a number of occasions. Norm and I have assisted BC Parks on a number of projects in Kakwa Park (cabin repairs, trail maintenance, route identification etc.). The following photo has been featured in a couple of magazines!